Users can create their own compositions mixing architectural and cinematic elements. One of the tactics of contemporary critical practice relies on a very simple act, namely the mash-up in which at least two usually disparate elements are brought together and we witness the often serendipitous and surprising mix that results. So it is with Greg Smith's Critical Sections, which unites architecture and cinema, specifically the domestic spaces of architecture and several iconic domestic spaces from movies, to ponder the city of Los Angeles through the emergence of new narrative spaces as they are conjured by the project's user. Certainly the union of architecture and cinema is nothing new. And indeed, Smith points to the influence of Bernard Tschumi's project The Manhattan Transcripts and its own blending of architecture and cinema. However, part of what is fascinating about Smith's collaboration with designer Erik Loyer is the creation of an improvisational space for realizing these connections. 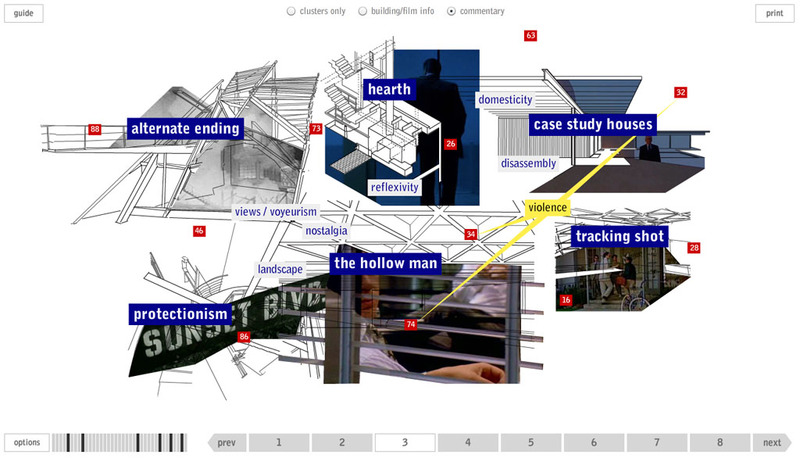 Moving several steps beyond the linear structure of conventional scholarly writing, Critical Sections allows users to explore, play and recombine elements from a visually rich palette of possibilities. Also of note here are the historiographical implications of Smith's project. As a contribution to the Memory issue of Vectors, Critical Sections proceeds from an already problematized approach to both history and remembering. As cultural historian Norman Klein (who wrote the project's peer response) has long argued, Los Angeles is a city notorious for its troubled relationship to the past, in no small part due to the omnipresence of the film and television industries. Architecture in Los Angeles likewise seems constantly to be in the process of reinventing itself, erasing past styles, buildings, even entire neighborhoods. But as Klein points out, Critical Sections is engaged not with the city of Los Angeles that is inhabited by real people of extraordinary economic, social and ethnic diversity, but with the "L.A." that emerges from an amalgam of fact, fiction, memory, dreams and imagination. Where are the bounds between real and imagined histories in a city such as this? And what is the proper form for thinking critically about the city and its past. In addressing such a well-worn topic that has already been theorized, criticized and historicized by some of today's most esoteric and incisive thinkers, Smith and Loyer manage to create a point of entry to thinking about the city that is both fresh and imaginative.